2018 New Style Cupcake Stand Display Tower Holder ,It will make you, your family and friends happy and impressed.Great way to display cakes,cupcakes,dessert,appetizers, brownies and other party treats. Have a upscale event you're hosting? How about a casual brunch for some close friends? Great for even the most space-restricted kitchens, the versatile unit can be disassembled and nested for a practical and storable addition to any serveware collection. The cupcake dessert tower assembles easily and cleans up quickly by hand. Take few pieces for family and friends as gift now, dont hesitate! 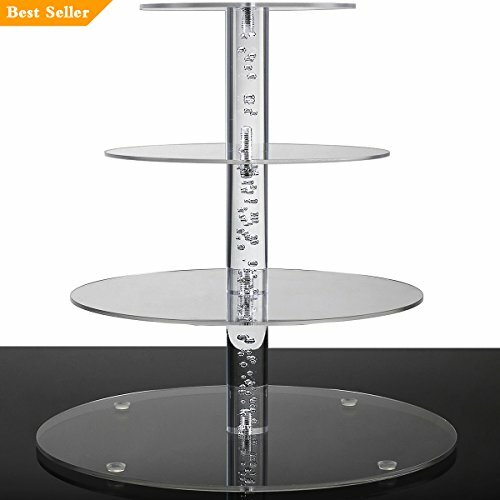 Diameter of each tier: 6" 8" 10" 12"
We are confident your family and guests will love our cupcake display stand. 2. Dimension: Plate diameter: 6'' 8'' 10'' 12'' , 4 Inches between each tier, 12'' tall over all. It can hold 36 pcs cupcakes and one cake. 5. STABILITY : By using Acrylic Rod with Screws instead of Tube to make this cupcake stand straight and stable, which can hold around 10 pounds cupcake, cakes, dessert, pastry or food. If you have any questions about this product by DYCacrlic, contact us by completing and submitting the form below. If you are looking for a specif part number, please include it with your message.